These people are sickos and that includes the artist.. If they want hell, they will certainly get it. It does indeed look like Baphomet, but the entire sculpture screams of chaos, so I guess he's going to bring about order. Yeah. That's it. This is going to be the great Pope who brings order out of chaos, a church for the poor, and I bet he's also going to section off a part of heaven for the poor, too. Easy does, here, guys. All positions of power have their opposites. Perhaps, the sculpture IS exactly what you think it is, but not for the reasons you think it is. Baphomet (Baal) is the spirit of the Earth. It is what we must pass through to get to heaven, when we die. Because, we are buried there. It is only associated with death and trickery, because of historical events. But, to be enlightened is to know of redemption, renewal, and rebirth. Man is made of Earth, as he is from it, but he is not limited to it. Humans seek higher ideals. We transcend earth. We are the dust of earth and return to the dust of earth, but we are life and our spirits rise above it. It speaks volumes of your ignorance that you cannot see or understand the more divine subtle meanings in images placed in front of your own eyes. Perhaps, instead of criticizing, you should be exploring your own inner-selves to determine your ideals, your path in life, and your eventual outcome. The sculpture to me (and I'm not catholic) is symbolic of mankinds' collective struggle out of the chaos of earthliness and our shared experiences as the attempts to discover the divinity of God's order. edit on 17-3-2013 by sanitus because: content added. The real reason I'm posting is to ask if anyone knows why satanist mark their territory. Does anyone know why? It seems like they would try to hide their faith since they're not so well received. Is there any biblical reason they do this? If you're correct and it was intended to be Baphomet, then why has the Catholic church never mentioned him? I went to Catholic Sunday School for 11 years and never once was he (actually it because it is both masculine and feminine) mentioned. 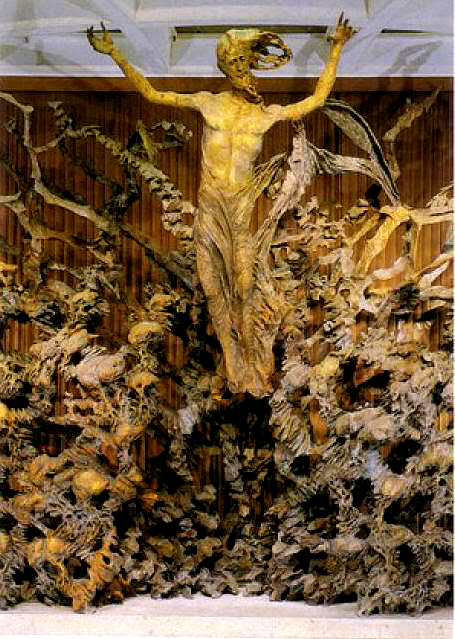 The sculpture in the throne room behind the Pope is called La Resurrezione ("The Resurrection") and it is by Italian artist, Pericle Fazzini. He began work on the thing in 1970 and finished it in 1977, just in time for Star Wars. He considered it to be his masterpiece, and if you can believe it, it's a bronze. It looks to me as though it is very hard to get close enough to it to get any good detail images, it also just looks like it is plain hard to photograph. It is also probably important to note that Fazzini had obvious surrealist influences, at least, and that is why people probably find a touch of the 'grotesque' in the work. The thing is convoluted to the point that it should come as no surprise that it be as conducive to pareidolia as any assembly of clouds; in fact, more so, if one has some religious paranoia going on. So, no, I don't see a 'Baphomet', and yes, I think way too much is being read in to the image. The answer to why Satanists expose themselves is easy. Satan (or the Angel of Earth) is also one of God's beloved angels. He is just being punished for questioning God. He is still loved by God. And, God wants him to learn from his mistakes and mend his ways. So, just as God seeks Satan's growth, so too does Satan seek God's forgiveness. They are part of the same family of beings. I must be some kind of innocent because I've never seen this statue before, and it's been in the main papal hall for 34 years! Popes often sit there and are shown talking there. I've missed it, and thought at first the picture was photoshopped. The dragon head on top (supposedly "Jesus" with his flowing hair - the hair looks just like a dragon skull with it's mouth open), the weird shapes and symbols, this is for sure the oddest thing I've ever seen in the vatican - and it's been there for over three decades!